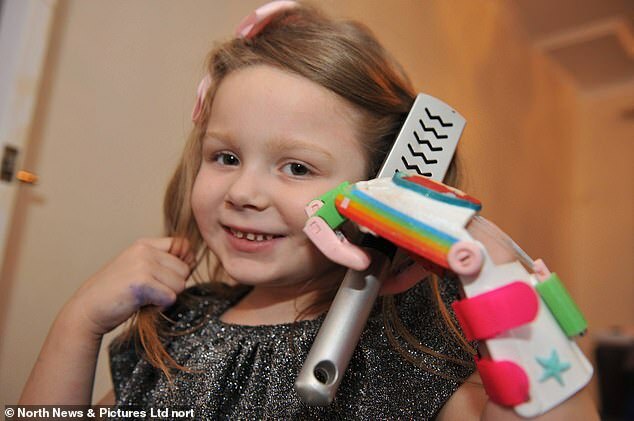 A six-year-old girl who was born with malformed fingers can finally brush her hair after getting a ‘robot hand’. 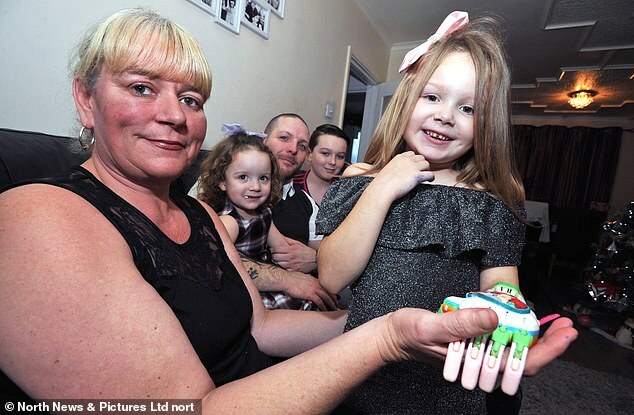 Leah Sweeney, of Castletown, Sunderland, has peromelic symbrachydactyly, which prevented the fingers on her left hand from forming properly. 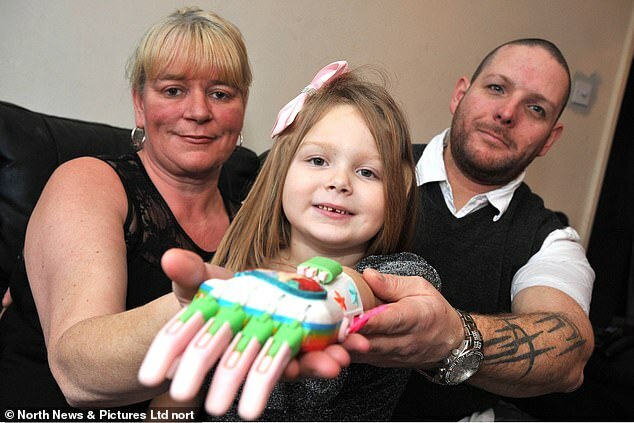 The youngster received the 3D prosthetic last Friday; just over a year after her parents Kelly Doran, 43, and Mark Sweeney, 36, sent off the youngster’s hand measurements. 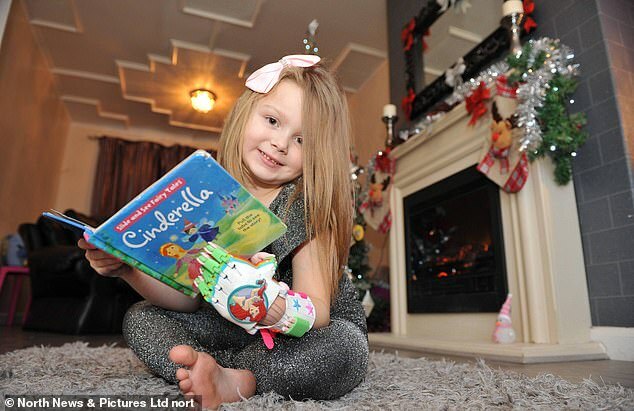 The charity Team UnLimbited made the artificial hand for free and even customised it in the theme of her favourite Disney princess Ariel. 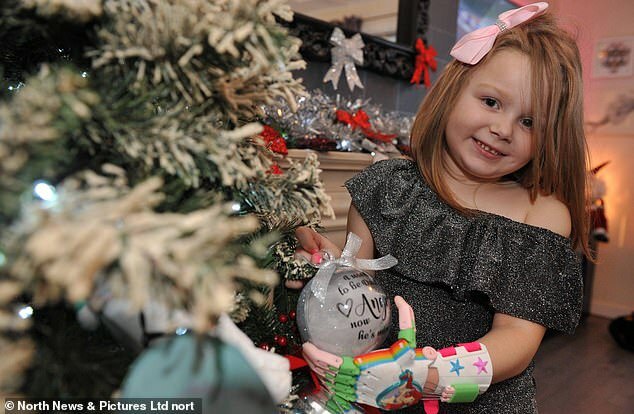 Leah’s parents hope the prosthetic will further boost the youngster’s confidence, with her already being able to ride a bike and play on the monkey bars. Leah’s parents contacted UnLimbited last year, with the finished product arriving last week while the youngster was off school with a stomach bug. ‘Trying to explain to a child that it takes time to build and they’re making it for lots of other children too was tough – children have a different level of patience so she was always asking when it was coming,’ Mr Sweeney said. Just days later, she can already pick up small objects and brush her hair. ‘She loves it. Just to be able to pick something up she’s so happy about it. It is just amazing to see, it changes her life really,’ Ms Doran said. 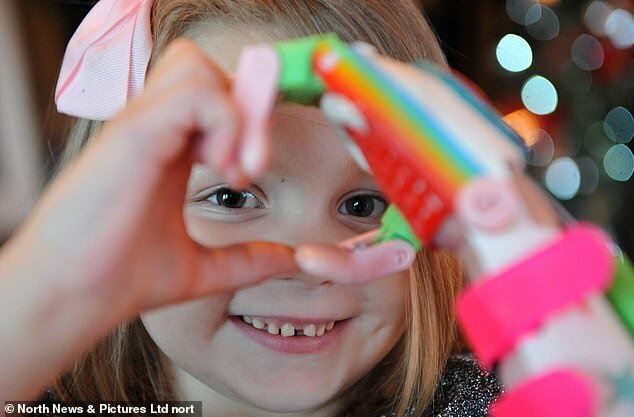 Her parents hope the artificial hand will help boost Leah’s confidence. 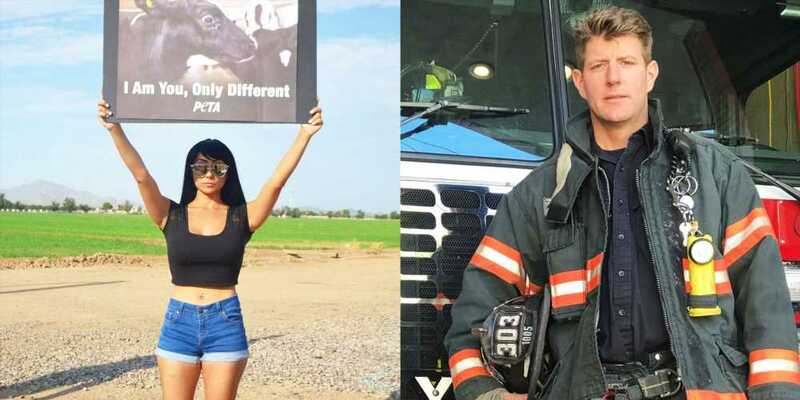 ‘There’s very little she can’t do. She rides a bike, she plays, she can do the monkey bars and she goes to school like everyone else,’ Mr Sweeney said. Symbrachydactyly defines a hand anomaly that affects one of the upper limbs and is present at birth. There are many different types with ‘peromelic’ occurring when the fingers are ‘nubbins’ or small lumps. It affects around one in every 32,000 births. Symbrachydactyly’s cause is unknown but may be related to the interruption of the blood supply to the developing arm between four and six weeks of pregnancy. There is nothing a pregnant woman can do to prevent the disorder, which is not hereditary. 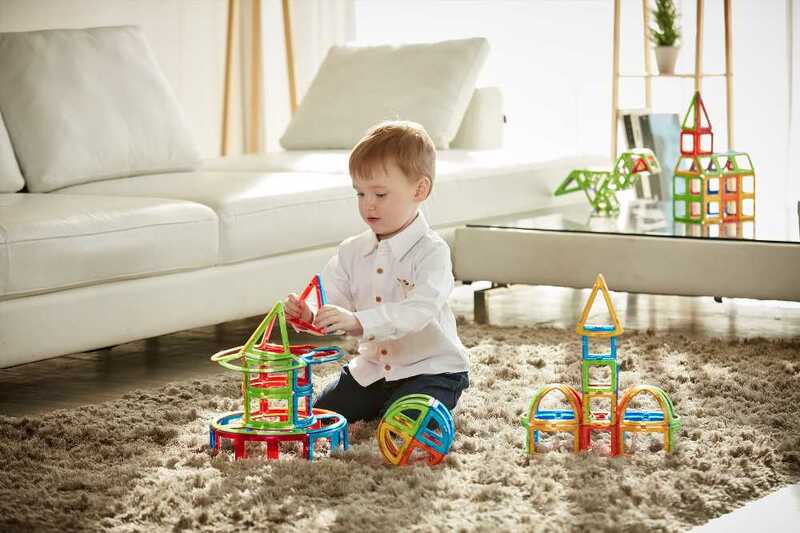 Most children use their unaffected hand as their dominant one, with the other hand just assisting. Surgery aims to upgrade the affected hand’, which can often still grip. 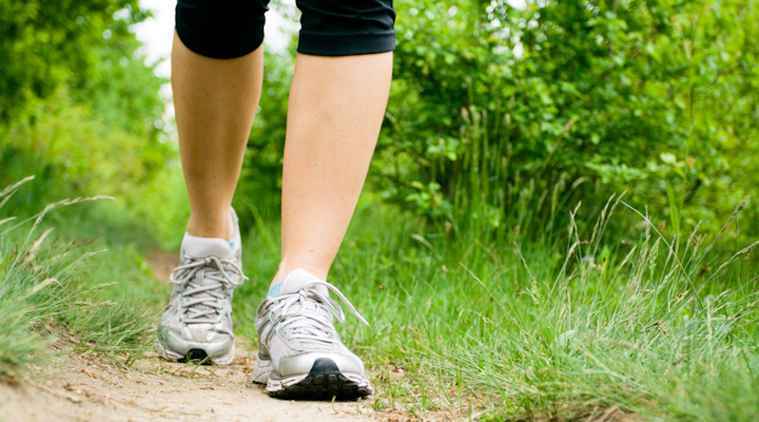 Many patients adapt well to their condition, however, some may struggle to use a zip, ride a bike, eat with cutlery, use scissors or play an instrument. There is also the option of prosthetics, which can be used alongside surgery. Artifical hands or limbs are often just given for cosmetic purposes. Team UnLimbited is a collaboration between Drew Murray and Stephen Davies, who design, build, fit and deliver 3D printed hands and arms for free. It has built around 100 devices for people between four and 70 years old in the UK since its 2015 launch. Mr Davies said: ‘Leah requested a rainbow Ariel hand. ‘We try to make it a special occasion for the children, something that makes them feel special and to boost their moral and give them self confidence. ‘It’s all about ability not disability. He added: ‘The importance of building our devices to a requested theme makes these arms not a thing, but an actual extension of self. ‘It turns children who are quite often picked on for their disability into the cool kid with the iron man or frozen arm. ‘The psychological effect of this is not to be underestimated. 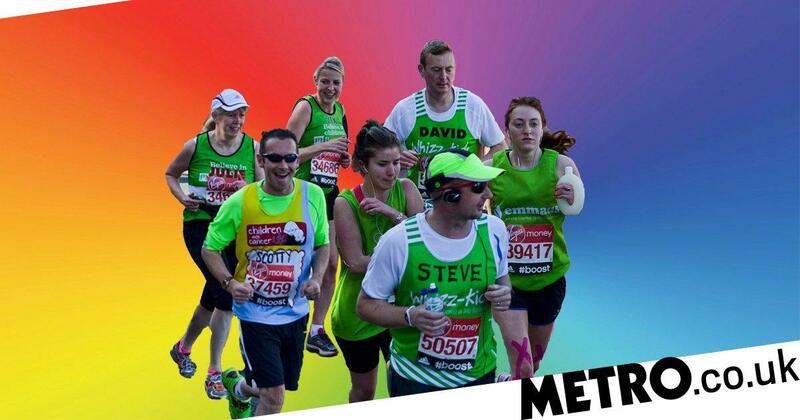 Leah’s family has set up a fundraising page to raise £200 for Team UnLimbited. Next Post:Just don’t keep still!